I could rock the Vegetarian thing and not miss meat too much. At times I've considered declaring myself a Pescatarian (person who doesn't eat meat but will eat fish) but it would be inconvenient to cut out a food group all together. Nonetheless, I've already enjoyed a couple of meals provided mostly with ingredients from my garden this year. We're having a heckofa hot spring in Tennessee thus far so a few items have grown like weeds already. Last week I prepared a fresh salad with my own lettuce, radishes and cucumbers (the cukes are sweet and crisp, yummy). The dressing is easy: T fat free mayo, T horseradish mustard, T of extra virgin olive oil, salt and pepper to taste, whisk. The next night I harvested quite a bit of basil (the leaves are huge!) and decided to try basil pesto. I didn't have pine nuts on hand so I substituted with roasted and salted sunflower seeds. Not bad. To make: use your food processor or blender to process basil, nuts, olive oil, salt, pepper, garlic powder and lemon juice (1 whole lemon). 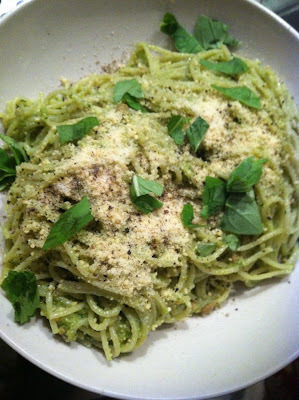 Thoroughly mix pesto and angel hair pasta, coating your pasta. Dress with parmesan cheese, cracked pepper and fresh basil. This was surprisingly very good and low cal/fat.